Hand-colored data from Mariner 4, the “first TV image of Mars,” captured on July 15, 1965. Via Dan Goods. In November 1964 NASA launched Mariner 4, the fourth of its ambitious series of robotic explorations of our three inner planet neighbors. Mariner 1 was lost during launch; Mariner 2 successfully flew past Venus; Mariner 3 failed to deploy; but on July 14–15, 1965, the 575-lb Mariner 4 became the first spacecraft to fly past Mars and capture close-up images of another planet from space. Of course the pictures that Mariner 4 captured were in greyscale and not like the beautiful color views we are used to seeing from spacecraft today. But thanks to one creative scientist at NASA (and a box of crayons) our first scenes of Mars from space were in brilliant color. The 21 images of Mars successfully captured by Mariner 4 were taken with its TV camera and stored on an onboard tape recorder to be transmitted back to Earth over the following three weeks as part of the 5.2Mb of data acquired during the flyby. The first of these images, a curved view looking over the planet’s surface from space, was assembled into a large color mosaic by scientists at JPL by printing out the arriving data on long strips of ticker-tape paper and—get this—hand-colored with pastel crayons. 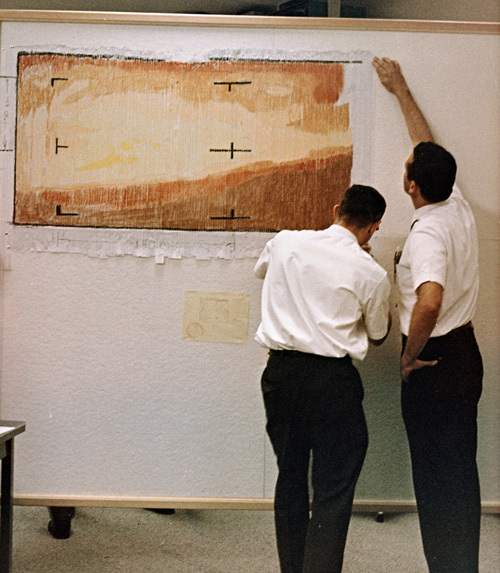 Richard Grumm, the scientist in charge of Mariner 4’s tape system, created a “Mars color palette” using pastel crayons he bought from an art store and assigned hues and values to specific numbers in the data, printed onto the ticker tape. By coloring them in and stapling the strips together, he and his team effectively created the first “color” image of Mars…and in fact it was the first close-up image of Mars to be shown on television since the media reporters were ravenous for something to show the public. 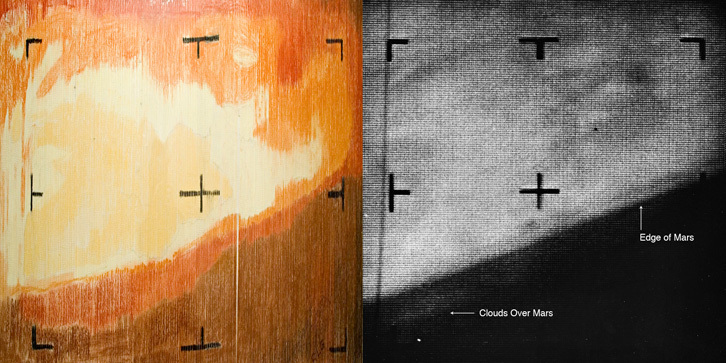 Once Mariner 4’s data were processed into actual images they showed how close Drumm’s handmade version really was…but of course they were in greyscale whereas his was in beautiful shades of Martian oranges and yellows. The color mosaic is currently displayed at JPL in Pasadena, CA. Read more about this fascinating “interplanetary color-by-numbers” in this blog post by Dan Goods, visual strategist at NASA’s Jet Propulsion Laboratory, and learn more about the Mariner 4 mission here.